The Peggy May Award was created to memorialize Peggy’s professional accomplishments and to recognize individuals who exemplify her outstanding achievement in library development and/or recruitment of personnel to the library field. Nominations are submitted to the MLA Awards Committee and the award is presented during the Association’s annual conference. Nominations should be mailed or emailed by September 1 to the MLA Executive Office. What made Peggy Jane May so special and why does the Mississippi Library Association recognize her with both an award and a scholarship in her name? She was a dreamer who worked hard to make her dreams reality. Graduating as valedictorian of her 1956 class at Collinsville, MS, she didn’t let her family’s limited income stop her from pursuing a dream of becoming a librarian. She enrolled at East Mississippi Junior College and paid her tuition by working as a student assistant in the English Department, an office worker for Lamar Franklin, and as Business Manager of Meridian Public Schools. She finished her associate’s degree in two years and somehow found time to be the editor of the yearbook, President of the Baptist Student Union, Chairwoman of the Women’s Student Government, a member of Delta Psi Omega and Phi Theta Kappa. Well-liked by classmates, Peggy was voted Miss EMJC. Peggy was among the first recipients of a scholarship from the Mississippi Library Association. In 1959, she was awarded $300 to study library science at Mississippi Southern College, now known as the University of Southern Mississippi. She worked as a student assistant in the library during the school year and for Meridian Public Schools in the summer. Following her graduation from USM, Peggy returned to EMJC, this time as the director of the Tubb Library, now known as the Tubb-May Library in her honor. She quickly became involved in the Mississippi Library Association and in 1960 was elected secretary of the College Libraries Section. She went on to join the Southeastern Library Association and the American Library Association and served on committees in all three organizations. Jeannine Laughlin tells us that Peggy would have been the MLA Vice-President/President-Elect in 1975 except for her untimely death. Peggy worked at EMJC for 8 years. Mary Lee Nelson Beal who worked with her during 3 of those years says “she gave 150% to those kids and that library. She made the library as good as it could possibly be with the funding that was available and even got a new library built.” Janice Irby who also worked with Peggy says, “She had a vivacious personality and was well-liked by everyone who knew her. During those years she spent her summers satisfying the requirements for a master’s degree in education from the University of Mississippi and working for the Mississippi Library Commission. I met her during the summer of 1967 when I worked as a summer intern for MLC. Peggy was the best part of that experience and she’s the reason I became a librarian. I remember vividly how we interns would gather in her motel room and talk for hours about all kinds of stuff, including our dreams and goals. She had a way of suggesting the questions we should be asking ourselves and a way of looking at you that made you know she really cared about what you decided. She was a great communicator. On June 1, 1968, Peggy joined the staff of MLC in a permanent position as Coordinator of Field Services. As an MLC consultant, Peggy traveled all over, from Iuka to Woodville, from Gulfport to Hernando. One day she would be helping a librarian in Kemper County defend a budget before the Board of Supervisors; the next suggesting a bookmobile schedule in Neshoba County and the next developing a program of special services for the handicapped in Jones County. She was constantly on the move: giving support, encouragement and creative suggestions to librarians all over the State. The administration of the Mississippi Library Commission was quick to recognize Peggy’s diligence, intellect, leadership abilities, and interpersonal skills. Elizabeth Long of MLC wrote, “When the current Library Services and Construction Act was amended by the Congress, the legislation included the requirement for the submission by the state agency of a Long-Range Program for Library Development. 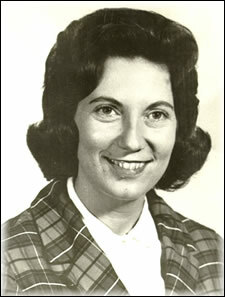 Peggy was given the assignment of producing the document and once again she gave a winning performance.” The minutes of the meeting of the MLC Board of Commissioners of May 25, 1972 commended Peggy and Margaret Elder for their work on the plan, as well as proposing that Peggy be promoted to the Assistant Director in charge of Library Development. This personal achievement was the basis for a Citation of Merit awarded by the Mississippi Library Association in 1973 which stated: ‘To Miss Peggy May for outstanding work on behalf of library development and recruitment throughout the State…” In a 1974 resolution passed by the Council of the American Library Association, Madel Morgan wrote that Peggy “won national acclaim for the document Long Range Program of Library Development in Mississippi, 1972″ and was recognized for her contributions to the profession. It could be considered that Peggy had already met her goals but she was always eager for a new challenge. She decided a doctoral degree in library science would better equip her to serve the librarians and people of Mississippi. So, late in the summer of 1973 she applied to Florida State University for the fall term. Not only was she accepted, she was also awarded a fellowship. I understand from George Lewis that she excelled in the library program there and was admired and respected by faculty and students as well. She returned to work at the Commission in 1974 with all requirements but her dissertation completed and plunged back into the work of library development with her characteristic zeal. She achieved a new level of leadership and service and was reaching for that next challenge . . . when all that brightness and sparkle we so dearly loved was snuffed out. She would want us to continue to recruit the brightest and best young people we know to the library profession, as she did. As one of the first recipients of a scholarship from the Mississippi Library Association, Peggy was deeply grateful for the assistance and the honor of being recognized. She would want us to continue that tradition and to provide as much help as we can for those seeking their library degrees.